When I was in high school and college, I worked at a lovely culinary establishment– a real local place– called Ruby Tuesday. Famous for its salad bar, Ruby Tuesday (like most suburban chain restaurants) had a staff of students and degenerates, a management rife with corporate B.S., and food that was true american crap. I mean, I’m not saying some of it wasn’t delicious, but let’s be serious, folks…. fine dining this wasn’t. 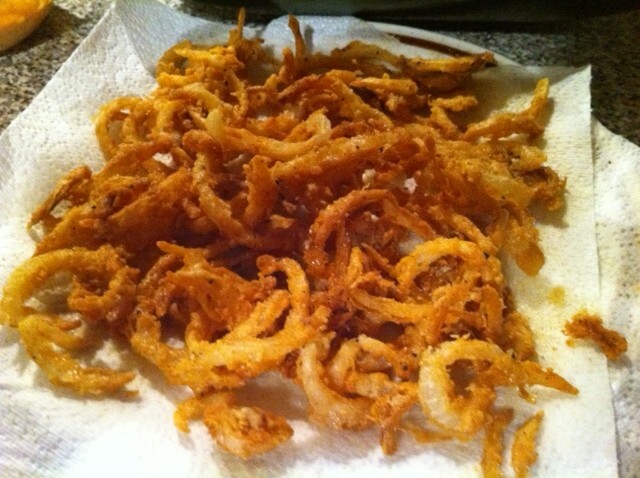 Having said that– one of the highlights of the menu were the onion straws. Crispy, thin strips of onion served on the side of a platter– and of course these came from a freezer bag, to a deep fryer, to your plate. Despite these dubious origins, these suckers were delicious. Heat the oil in the cast iron skillet to a heat of 375 degrees (use your nifty thermometer from the fried chicken!). Meanwhile, in a large mixing bowl, mix the flour, cayenne, and salt & pepper. Take the onions out and place a handful (or tong-ful) at a time into the flour mixture. When the oil is hot enough, take the tong-ful of onions (being sure to tap on the side of the bowl to rid excess flour) and carefully place them in the hot oil. Repeat this with several more tong-fuls of onions– you should be able to fit about 4 in the pan. And, by the time you set the last one in, the first one should be ready to be turned. Cook the onions for 1-2 minutes per bunch, then remove and let drain on a paper towel. Repeat until you run out of onions. Toss finished onions with Lawry’s for that little extra ooomph. And everybody likes ooomph. Mix all of that goodness together and boom! Deliciousness. Tip: the longer you let it sit in the fridge before serving, the better it tastes, so if you have a spare half-hour, let the flavors all hang out together for a bit before slathering it on the onions. 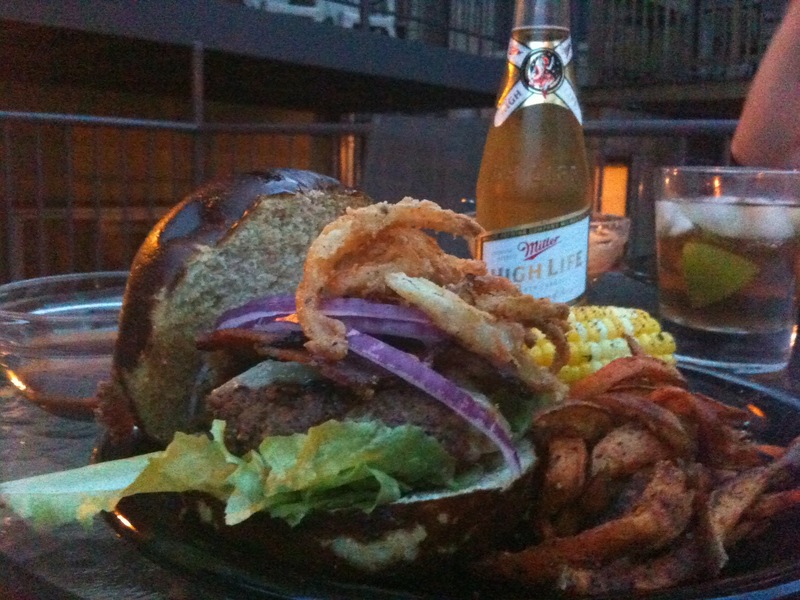 As it happened, I put the sauce on my burger last night, and topped it with onion straws. Result? Perfect summer evening.